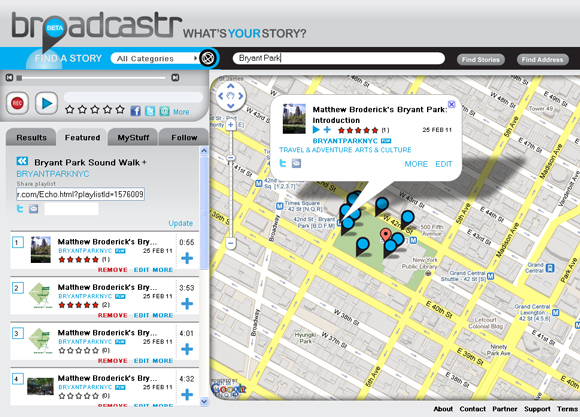 We're happy to featured on Broadcastr, a brand new social media platform for location-based audio! The nuts and bolts of Broadcastr are that people (like us, and you!) can easily create and share audio recordings that are tagged to locations on a map. Look for our official playlist in the Featured Tab, or search for Bryant Park NYC. Right now you'll find recordings from Matthew Broderick (who happens to be a big fan of the park!) walking you through popular spots like the Reading Room and Fountain Terrace. Stay tuned, because we'll be adding insider audio clips from park managers and employees, most notably, the people who have been with Bryant Park Corporation from the very beginning. In a couple of weeks, Broadcastr will launch their mobile apps for iPhones and Androids, making it possible to record stories and sound bites on the go. You'll also be able to walk through the park and hear our stories stream automatically into your headphones, based on your physical location. We look forward to hearing your stories about the park...make sure to tag them with #BryantParkNYC! Check out Broadcastr at beta.broadcastr.com and the site's recent coverage in The Wall Street Journal and The New York Times.